While Remi Eriksen’s tenure at the top of DNV GL has coincided almost perfectly with one of the maritime industry’s deepest and longest slumps, he said that there is the proverbial light at the end of the tunnel, with a small pick up in shipbuilding year-on-year since 2016. “We have been through challenging markets for the last three years, particularly the newbuilding market which is very important for class,” said Ericksen. “But it was needed because there were too many ships chasing too little work. It was needed, but it also means that shipbuilding activity has been at a historic low. The upturn is coming, but it will be nothing like the super cycle we saw from 2005 to 2015. As the collective maritime market digests a challenging market, shipowners must also invest in the face of many new regulatory demands. “From the sulfur cap in 2020 to the ballast water management technology, to the CO2 road map that IMO has decided on, there are many things happening on the regulatory side, along with a challenging market,” said Eriksen. “Our purpose is the same, safeguarding life, property and the environment. Our core markets are the same: maritime (the biggest); oil and gas, and energy. The main difference now is we are leaner, more agile, more responsive and for sure more digital than we were three years ago. While ‘speed of change’ and ‘maritime’ can sometimes be an oxymoron, the digital trend in maritime is real and manifesting itself in many ways. Looking at it through the DNV GL lens, “a lot of this goes into sensor and control systems, and this will be relevant for all types of shipping,” said Eriksen. “We are now introducing an Open Simulation Platform where different players, different equipment suppliers can simulate the interaction between different pieces of equipment, you can actually ‘test’ the interaction and the interfaces before you start building. We’re now running a joint industry project (JIP) … we have the technology to enable the open simulation platform, but now we need to engage the different players in the right way to start using the platform. It is in the early phase, but should be ready in a year or so.”“This can help elevate situational awareness and ultimately autonomous shipping. Sensor and sensor fusion is one end, decision making is another.” One project worth watching is the Yara Birkland, which will be operational in 2019. “The remote ops will be the first step, then you need to have the correct sensor and sensor fusion so that you have the correct situational understanding – so you know what’s going on. 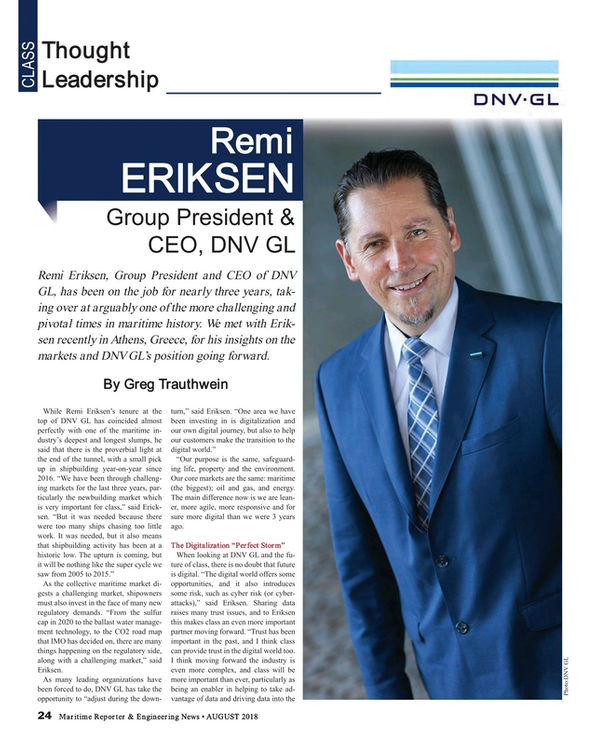 The other part is on the decision making, the logic.” The next step is not doing the decision making remotely, rather on the vessels by computers, “A lot of research is going into that,” Eriksen said.A cornerstone of the DNV GL digitalization path its Veracity platform, an open industry, secure platform for digital innovation and industry collaboration. 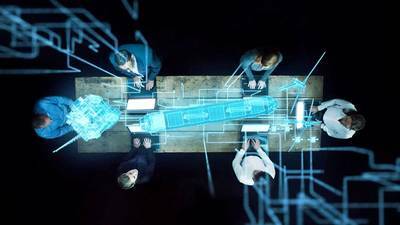 The platform includes a marketplace where users can access all DNV GL's digital services and applications, as well as services from third parties. Veracity also includes a community for developers to make it easier to develop new applications and analytics. Finally, the platform facilitates secure and easy data management and data sharing. “It (Veracity) is gaining traction, today with almost 130,000 users representing 1,500 companies, with close to 1 million service subscriptions meaning each user is subscribing to more than seven services in average. We have seen this scaling up rapidly,” said Eriksen. While much of the focus today is on data – the collection, dissemination and efficient deployment of data – not much has been reported on the cost of Bad Data. Remi Eriksen, Group President & CEO of DNV GL, put the matter in perspective during a presentation in Athens, Greece, during Posidonia. Eriksen, citing estimates from IBM, said that in 2016, in the U.S. alone, $3.1 trillion* was IBM’s estimate of the yearly cost of poor quality data, a stunning figure, particularly when you consider that research firm IDC estimates that the size of the big data market globally in 2016 was a mere (by comparison) $136 billion.